DawnSignPress executive, Tina Jo Breindel, receives honor at New York School for the Deaf 200th Anniversary celebration. 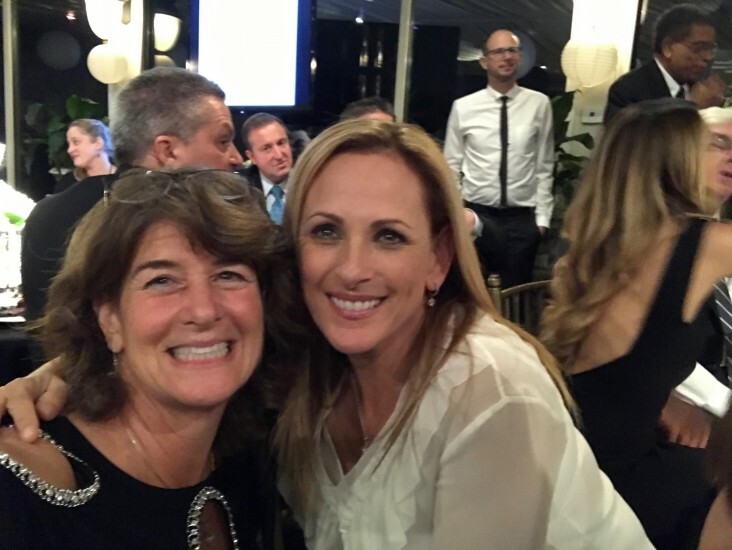 San Diego, CA - Local San Diego Media and Publishing House, DawnSignPress, announced that Tina Jo Breindel, executive in charge of community relations, shared the spotlight with Oscar winner, Marlee Matlin, to receive a service award from New York School for the Deaf. Singled out as a ‘tireless advocate for literacy for Deaf children’ and a treasured Alumna of New York School for the Deaf, Ms. Breindel accepted the award at a Black and White Gala held at Tarrytown Hill mansion, the home of Samuel Clemens, aka Mark Twain. Accepting the award, Breindel said: "My parents treated me like any other child. I was different only because I was Deaf...and still am. It wasn't just about communication, they also saw that I was acquiring a language. My parents saw I was happy when I came home smiling and full of stories about what I learned (at school)." Proceeds from the Gala benefit the school's program: Science, Technology, Engineering, Arts, and Mathematics (STEAM) and also serve to broaden vocational training. About DawnSignPress: DawnSignPress is a media and publishing house that creates, develops, produces, publishes and distributes quality American Sign Language (ASL) and Deaf culture-related materials. DawnSign is on the cutting edge of the educational, cultural, and social trends in the Deaf world. Deaf-owned and operated, DawnSignPress produces materials that raise standards in ASL education, break new ground in ASL literature and the arts, and pserve the unique and rich contributions of Deaf people. For more information, visit: www.dawnsign.com.